About a month ago I went to Inamo with two of my friends. I had actually bought a gift voucher for them for Christmas from Virgin Experience Days. The gift voucher included a glass of champagne along with 8 tasting dishes. It was around £50 for two people which I think is really good. It took us ages to find a date where we could all go because we were all so busy with work and university. We decided to go to the one in Soho as it was easiest for all of us to get to however, they also have restaurants in Covent Garden & Camden. As the gift voucher was for the two of them we had to spend a minimum of £40 for myself because I didn’t have a voucher. This wasn’t an issue as the dishes were between £6-£12 each. 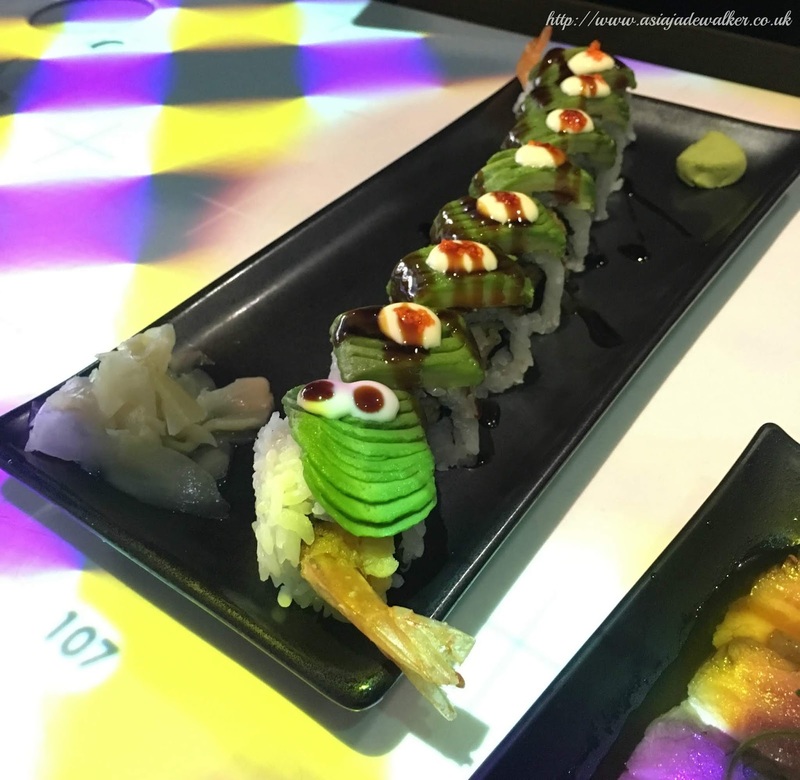 What is unique about Inamo is that it is an interactive dining experience. It takes away the need for a waitress as you can order your food, drinks, and receipts from the interactive menus on the tables. 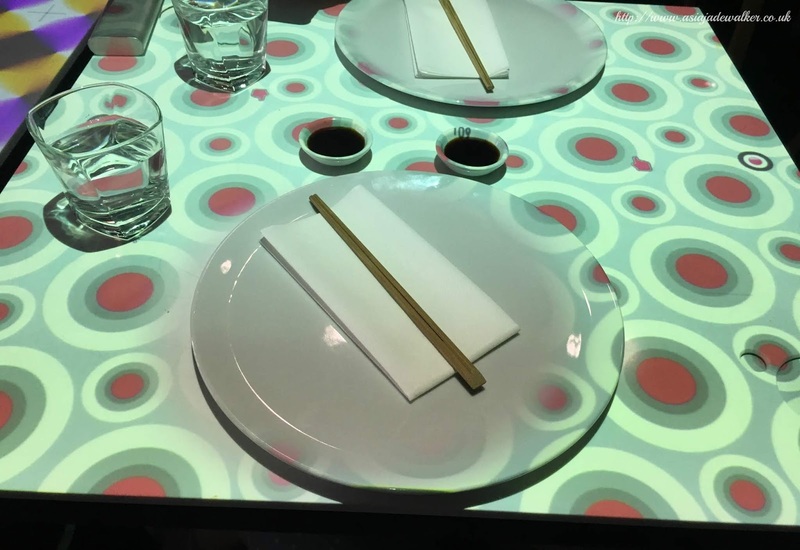 Above tables, there are projectors that project the interactive screen onto the tables. 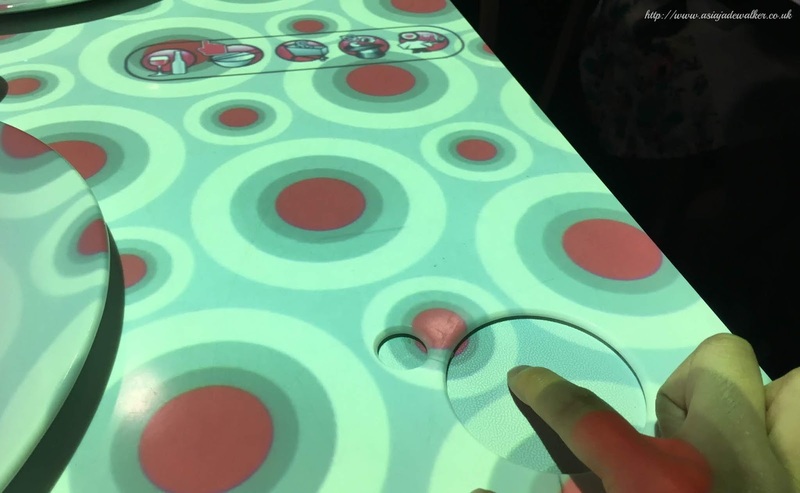 On the tables, there is a mouse that you can use to navigate the menu. The whole concept is pretty cool and certainly futuristic. I can definitely see more restaurants going towards this as the need for human interaction is getting less and less. Using the menu through the interactive tool was really fun and you could also choose to play games as well. For example, I can play a game similar to ping-pong with the person sitting across from me using the interactive tool. As we had already got 8 dishes, to begin with, we ordered about three or four more to meet the £40 minimum spend for me. 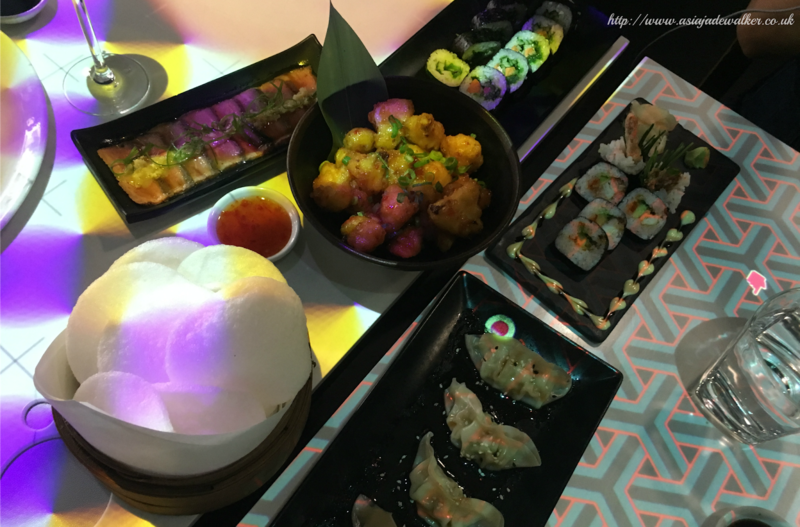 We had a mixture of dishes such as sushi, vegetable gyozas, fried cauliflower and some rare meat. Each dish was delicious and I tried everything as there were three of us we decided to share it all instead of each person having a number of dishes to themselves. One of my favourite things was the sushi as I absolutely love sushi and I hadn’t had it for a long time so it was nice to feed my craving for it. The other dish I really liked and wasn’t quite expecting to like it was the fried cauliflower as it was really light which meant I ate so much of it. By the time we had finished the first six courses we were already full up, however, unbeknown to us we still had five more dishes to go. Our last course was made up of five different dishes. A few of them I didn’t really like such as the fried tofu as I have never been a fan of tofu. The prawns with chili and a creamy dressing I didn’t really like either as they tasted really heavy and I felt that if I ate them it wouldn’t agree with my stomach. I really liked the BBQ chicken as it tasted so yummy and the chicken was really tender. The prawns in the nest shaped design were also really tasty as the prawn inside was fried and went really well with the nest. One of the main things we all liked was the presentation of the food. 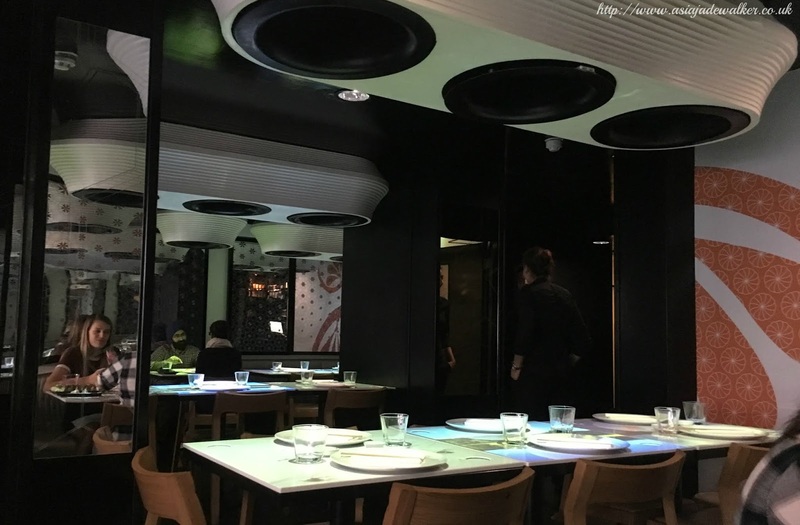 The only downside was that the lighting was a bit rubbish in the restaurant and it was hard to take any nice photos. 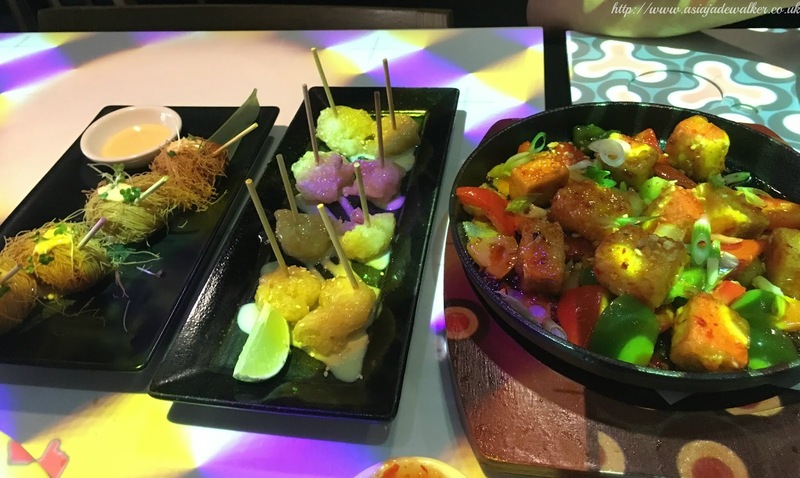 If you are looking for somewhere fun to go and eat I would highly recommend this place as it is a great place to have a fun evening out with your friends or family as well as eat yummy Asian food. 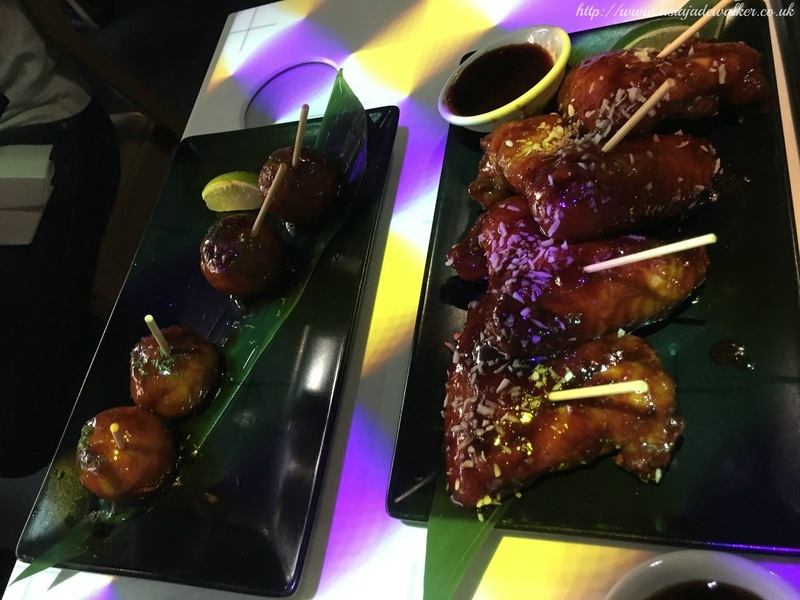 It is sort of a mixture of Japanese, Chinese, Thai & Korean cuisine as it is a pan-Asian restaurant. We all really enjoyed it and it was something we had never experienced before. None of my friends had been there before which I quite liked as I went in there with an open mind and I was pleasantly surprised. I thought that maybe because most of it was done electronically that there may be faults with the system or it might be slower. The service was excellent and the food came out really quickly which was good because we were all really hungry. I would probably give this restaurant an 8/10 as it was really good and we all enjoyed it but there is still room for improvements. One thing I would say would be a good ideas is to brighten the room a bit more because it is very dim and dark. I know that it is futeristic and different but I found it quite harsh on my eyes as it was dark but there was also a lot of patterns around. "I Got A New Job"
"Video | £81.33 Tesco Weekly Food Shop"